Wow! The photo of this painting, done many years ago, was just sent to me. Interesting that some of my recent posts have also been about “tears”. Much of my art reflects the images of inner realms of the human condition…both heaven and hell….and its journey of transformation. I see this painting as another reflection of the profound and essential un-doing of the dense false self, and the resistance to that process ( ie….pain and suffering )…and the subsequent opening and freeing ( surrender ) once the resistance is released …. an indispensable part of my own process of awakening from the “dream”. 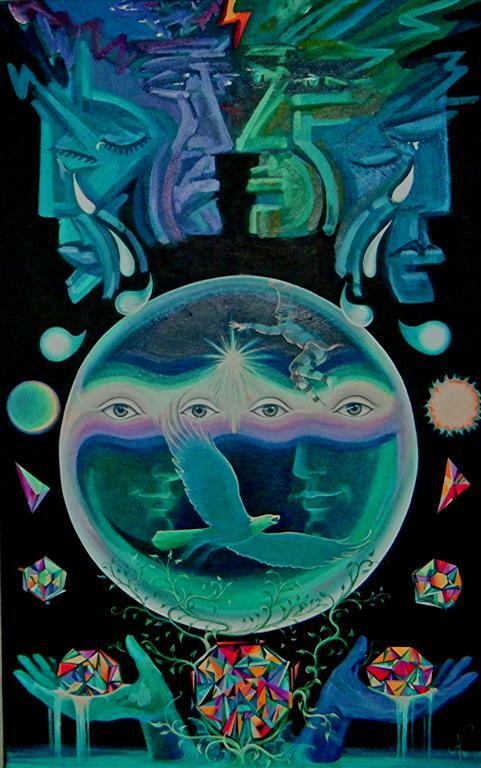 As tears from their depths fall, they transform, like alchemy …to sun and moon, to crystals, into a sea of transformed tears at the bottom, out of which grows a huge crystal, and two hands reaching out, holding more crystals. There is a vine growing up out of this rich liquid as well, and it sustains and embraces a huge crystal ball. Within this crystal ball is a vision of peace, harmony, these faces transformed, and a connection/reflection of these two in spirit, and the eagle flies its noble freedom….and Heyoka, the sacred clown/jester/fool, of the Lakota tradition, joyfully dances the cosmic joke. I agree, Chrome….but at the same time we have to ask ourselves: is it all a dream?…illusions, veils and mirrors? Where does the “real” that we do have the power to create/imagine in our minds end…and genuine Truth begin? Sometimes my paintings aren’t even clear to me when i paint them…they reveal themselves eventually when i catch up to what they are “saying”. Thank you for your support, Chrome…you are a brilliant mind and artist, and a recent author of a fascinating book, recording a journey i want to read!!! Your reflection on all this means a lot to me. Wow, your comments on this one as well as the painting itself, so fraught with symbolism, symbols that I have seen in your other paintings as well. It’s very powerful, in simple yet meaningful imagery, the visual metaphor, of the cleansing and the undoing of destructive and repetitive illusions, that sometimes, seem to be so woven into us, we can barely separate them and get on with our lives, and our loves without being eternally chained to false projections. The title and once again I commend you on a great one:) is perfect. It is what we hope our tears, and pain, and the breaking away from all that is not helping us, will reap in the end. The tears, the crystals, the mirrors and the Heyoka doing his dance of the jester, knowing that all of our petty worries and struggles, don’t really matter, not from where he is seeing it. So nice to see this one Jan, and very glad you now have an image of it. I am thinking a lot about the sphere shape lately, and find it interesting that where the peace finally takes place is inside of one. Once again, Karima, thank you for an in depth, heart felt comment…you really do “get” what is happening with my art…and that is a gift to me….like i am being “heard”. You are an inspiration to me….in many ways. Ah yes…the mysterious globe….i too have had astonishing experiences with globes of light many years ago, for real…and the one you write about in your recent Colored Dream series in your blog, is dynamic, high romance and takes one into expanded ways to relate to life forms beyond our own limited concept physical bodies. What goes on in realms beyond the physical form are in both of our art forms….fun! Thank you as well Vivian for your continued support…and also for posting your comments! This way of sharing my art is so new to me….i have never written about my paintings before. In fact, many were never even named before creating my website and this blog. So all this is taking me for a ride as well…i am actually learning more about my art…something i did not expect….but am enjoying. In fact, at the beginning of this blog marks a big change in my art, one that is new and feels like a journey not yet taken, by me. I wonder what will spark my inspiration next…!! Hehe! I continue learning to more deeply surrender, and to cultivate open receptivity…this is how the magic can come in!